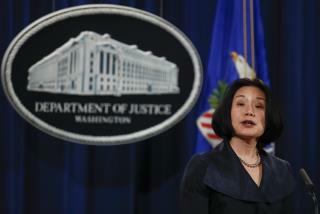 (Newser) – President Trump's nomination of Jessie Liu for the third-highest spot in the Justice Department creates a vacancy that could allow Trump to name the person who will oversee the most politically charged cases in Washington, including those stemming from special counsel Robert Mueller's probe. As Mueller winds down his Russia investigation, lawyers from the US attorney's office in Washington—the office Liu runs—have been assigned to key Mueller cases. The office is also generally responsible for handling potential prosecutions if Congress finds a witness in contempt. Trump had met with Liu before he nominated her to the US attorney's post in 2017, but her confirmation—just months after Mueller's appointment—didn't generate much controversy. But anyone Trump nominates to replace her will likely face more scrutiny, with Mueller believed to be nearing the end of his two-year investigation, the AP reports. While Mueller's team has handled the prosecutions for most of the probe, prosecutors from the US attorney's office in Washington—the nation's largest—appear poised to take over some cases when Mueller is finished. That includes the case against Trump confidant Roger Stone. The office is handling several other Russia-related cases that do not directly involve Trump or his associates, including a case against the Internet Research Agency, a Russian troll farm indicted in February 2018 and accused of running an expansive social media campaign intended to influence the 2016 presidential election. It's also handling the criminal case against 12 Russian intelligence officers accused of hacking into the Democratic National Committee and Hillary Clinton's campaign. The White House announced Trump's plan to nominate Liu as associate attorney general Tuesday, the Washington Post reports. I wonder if it's painful to have a large bird coming out of the top of one's head? Trey Gowdy is available. Would be SUPERB ! There seems to be some confusion among the trolls. Mueller's job was about the 2016 election and the Russians. He was to investigate who was involved in hijacking the electoral process. What ever didn't fall into Mueller's mandate was transferred to the appropriate districts and the DOJ. Mueller was never supposed to be a substitute for Congress. It IS the job of Congress to investigate crimes and wrongdoing. Unfortunately, for 2 yrs., the GOP was covering up for Trump.